The statement came on a day when Union Minister and local BJP MP Mahesh Sharma, along with other party members, visited the gangrape victims’ residence in Noida. CHIEF MINISTER Akhilesh Yadav on Thursday defended his minister, Azam Khan, for describing the Bulandshahr gangrape incident as a “political conspiracy against the SP”. 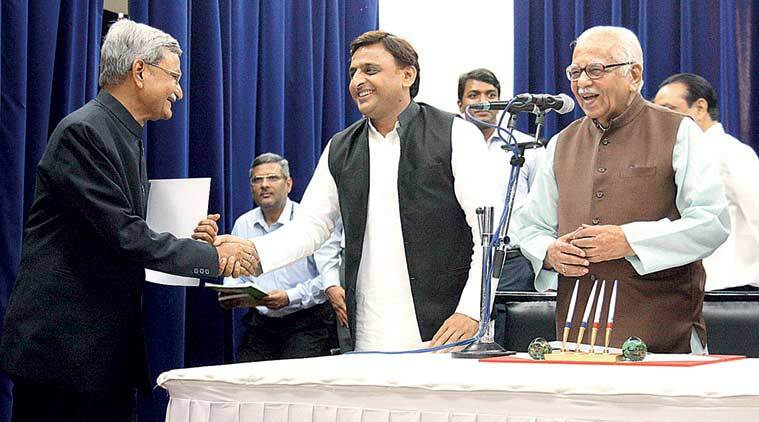 “What else should we call it if not a political conspiracy?” Akhilesh said after the swearing-in ceremony of the new state Up-Lokayukta, Shambu Singh Yadav, at Raj Bhavan. The statement comes on a day when Union Minister and local BJP MP Mahesh Sharma, along with other party members, visited the gangrape victims’ at their residence in Noida. Last week, a 14-year-old girl and her mother were gangraped on NH-91 in Bulandshahr. “There should be no politics… The government will help the victims and take strict action against the culprits… If they have any suggestions, they should give it to us. But again, the question is what were BJP leaders with minister rank doing behind closed doors. Are they not doing conspiracy? What else should we call it if is not political conspiracy?” he added. Akhilesh alleged that in the past as well, hype was built around the Badaun case, in which two sisters were raped, to defame his government. “They (BJP) are doing this because they have scored a zero in the development front,” he claimed. “Take for example the Bareilly incident… Can’t people love each other?… If there is a relationship, how are you showing it… Is it right?” he said while referring to a 19-year-old private school teacher, who after alleging that she was dragged into a moving car and raped by three men in Bareilly, changed her statement on Wednesday and accused her boyfriend of sexually assaulting her and making a video clip of the act. Earlier, while launching the book of former Up-Lokayukta Swatantra Singh after the oath taking ceremony, Governor Ram Naik said corruption was spreading in society like cancer. The Governor also suggested that Lokayukta probe reports should be made available online.